Things might soon get Mega again. 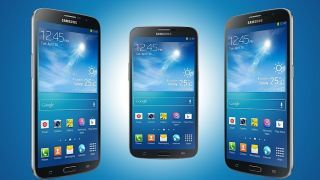 There have been a few rumblings that a Samsung Galaxy Mega 2 is on the way, and not only does that now look more likely, but it appears an announcement may be imminent. SamMobile noticed that firmware for the SM-G750, which is believed to be the Galaxy Mega 2, is now available online, suggesting that it may soon launch. We can't say exactly when that launch might be, but IFA 2014 is taking place at the beginning of September so there's always a chance that Samsung will announce it there. Though if it does it will likely be buried beneath the hype around the Galaxy Note 4. Current rumours suggest that it will probably have a 5.8-6-inch 720p screen, a Snapdragon 400 or 410 processor, 2GB of RAM, a 12 or 13MP rear camera, 8GB of internal storage along with a microSD card slot, and dimensions of 163.6 x 84.9 x 8.6mm. So it should be a slight upgrade over the first Samsung Galaxy Mega, but every bit as mid-range. We were disappointed by the resolution and lack of internal storage on that phablet and it looks like the same may hold true again, but if it's priced right it could be an affordable alternative to the Galaxy Note 4.